The ToU constitute the entire agreement between you and Hypable and govern your use of Hypable, superseding any prior agreements between you and Hypable. Additional terms and conditions may apply when you use affiliate services or third-party content, including but not limited to Facebook, Twitter, YouTube, iTunes, Google+ and more. The ToU and the relationship between you and Hypable shall be governed by the laws of the State of Florida and the county of Miami-Dade without regard to its conflict of law provisions. In the event of any dispute regarding this Agreement or Hypable, you agree that such dispute shall be submitted to Judicial Arbitration and Mediation Services, Inc. (“JAMS”) for binding arbitration under its rules then in effect in New York City, NY, before one arbitrator to be mutually agreed upon by both parties. The parties agree to share equally in the arbitration costs incurred. The failure of Hypable to exercise or enforce any right or provision of the ToU shall not constitute a waiver of such right or provision, and any waiver of a right or provision with regard to a specific instance shall not constitute a waiver of any other breaches of that right or provision, even with regard to the same user. If any provision of the ToU is found by a court of competent jurisdiction to be invalid, the parties nevertheless agree that the court should endeavour to give effect to the parties’ intentions as reflected in the provision, and the other provisions of the ToU remain in full force and effect. You agree that, regardless of any statute or law to the contrary, any claim or cause of action arising out of or related to use of Hypable or the ToU must be filed within one (1) year after such claim or cause of action arose or be forever barred. if you are a resident or national of any country to which the U.S. has mandated a trade embargo. 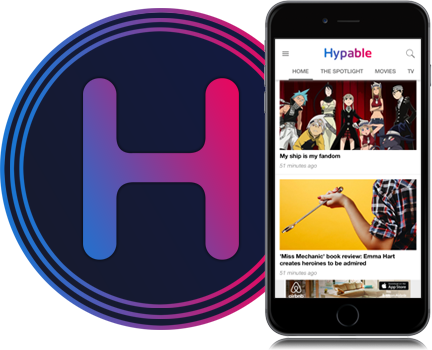 the quality of any products, Services, information, or other material purchased or obtained by you through Hypable will meet your expectations. no advice or information, whether oral or written, obtained by you from Hypable or through or from your use of Hypable shall create any warranty not expressly stated in the ToU. any other matter relating to Hypable. You agree to indemnify and hold Hypable, its subsidiaries, affiliates or other partners, and its volunteers, harmless from any claim or demand, including reasonable attorneys’ fees, made by any third party due to or arising out of Content you submit, post, transmit or make available through Hypable, your use of Hypable, your connection to Hypable, your use of any third party site linked to or by Hypable or its users, your use of the ToU, or your violation of any rights of another. You agree that Hypable shall not be liable to you or any third-party for any termination of or limitation on your access to Hypable. You agree not to repost or redistribute content found on Hypable without full credit to and for Hypable including a full and complete copyright statement. Those under the age of thirteen are permitted to read and download content posted and/or hosted on the Site; however, those under the age of thirteen are not permitted to Like, comment on or post to the Hypable Facebook page or submit content on, through or to Hypable, in compliance with the United States Federal Trade Commission regulations regarding online privacy and protection issues for children under thirteen. Accordingly, if you submit Content to Hypable, you thereby affirm that you are over thirteen years of age. Hypable and its related sites are designed for adults and do not knowingly solicit or collect information from children who are twelve years old or younger. Any child under thirteen who submits content on, through or to the site in any way will be banned to the extent reasonably possible. You agree not to reproduce, duplicate, copy, sell, resell or exploit for any commercial purposes any portion of the Site or any Material on the Site, other than on and/or in the Site, or in the course of your use of or access to the Site. Hypable reserves the right to modify, suspend or discontinue, temporarily or permanently, Hypable (or any part thereof) at any time and from time to time with or without notice. You agree that Hypable shall not be liable to you for any modification, suspension or discontinuance of Hypable. The Site may provide, or third parties may provide as part of the Content, links to and incorporation of content provided by and/or created by third parties, including information, sites and/or resources (“Third-Party Content”. Because Hypable has no control over Third Party Content, you acknowledge and agree that Hypable is not responsible for the availability of such external sites or resources, and does not endorse and is not responsible or liable for any content, advertising, products, or other material on or available from such sites or resources. You further acknowledge and agree that Hypable shall not be responsible or liable, directly or indirectly, for any damage or loss caused or alleged to be caused by or in connection with use of or reliance on any such content, goods or services available on or through any such external site or resource. Hypable may from time to time effect, host or provide access to or information about contests, challenges, scholarships and/or games (“Contests”). Any such Contests conducted by Hypable will be effected pursuant to separate rules, terms and conditions that are created for each and any Contest. Any Contests conducted by any third party will be effected pursuant to said third party’s rules, terms and conditions and not under the control of or by Hypable. You are responsible for obtaining access to Hypable and acknowledge that such access may involve third party fees (such as Internet service provider or airtime charges). You are responsible for applicable fees, including those fees associated with the display or delivery of advertisements, if applicable. In addition, you must provide and are responsible for all equipment necessary to access Hypable. The Internet is global in scope, and you may be able to access Hypable from outside the United States. You therefore agree to comply with all applicable rules regarding online conduct and acceptable subject matter. Specifically, and without limitation, you agree to comply with all applicable laws regarding the transmission of technical data exported to or from the United States and/or to or from the country from which you are accessing Hypable. For each visitor to our Web page, our Web server automatically recognizes and archives the visitor’s domain name, including IP address. We collect the e-mail addresses of those who communicate with us via e-mail, user-specific information on what pages users access or visit, the IP address of each visitor to Hypable, and any information that a visitor posts on the site or sends to any of our official e-mail addresses. The information we collect is used to improve the content of our Web page and customize the content and/or layout of our page for each individual visitor, and is not shared with other organizations. Though we make every effort to preserve user privacy, we may need to disclose personal information when required by law wherein we have a good-faith belief that such action is necessary to comply with a current judicial proceeding, a court order or legal process served on Hypable. If you request that Hypable send information to a third party, such as a friend, Hypable may utilize the contact data provided by you to forward information to said third party, and may retain said contact data as long as we feel appropriate. With respect to Ad Servers: Hypable may include advertisements and content served by third-party providers and reserves the right to share personally identifying information with its business partners, designees, advertisers, marketing firms and related third parties. Hypable may, at a future time, use customer information for new, unanticipated uses not previously disclosed in our privacy notice. If our information practices change at some time in the future we will post the policy changes to our Web site to notify you of these changes, and such changes will only be used for information provided by those who have used the Site after the effective date of such policy changes. If you are concerned about how your information is used, you should check back at our Web site periodically. Hypable reserves the right to communicate with its users via communications methods provided by each or any user. You shall not upload to, email to, distribute or otherwise publish through, or share on Hypable any Content which is deemed by Hypable, in its sole discretion, to be libelous, defamatory, obscene, pornographic, harassing, or infringing of third party copyrights, trademarks or other intellectual property rights, or which otherwise violates any law, or which is deemed by Hypable in its sole discretion to be advertising or “spam”. If you post reviews or comments on Hypable, or on any page or site managed or controlled by Hypable, you grant Hypable a non-exclusive, royalty-free, perpetual, irrevocable, and fully sublicensable right to use, reproduce, modify, adapt, publish, translate, create derivative works from, distribute, and display such reviews and comments throughout the world in any media. You also grant Hypable the right to include and/or use the name that you submit with any review or comment, if any, in connection with such review or comment. You understand that all Content, including but not limited to submissions, information, data, text, graphics, messages or other materials, is the sole responsibility of the persons from which such Content originated. This means that you, and not Hypable, are entirely responsible for all Content that you upload, post, e-mail, transmit or otherwise make available via Hypable. You understand that by using Hypable, you may be exposed to material that is offensive, indecent or objectionable. any cause or action arising from material contained in the Content that violates the terms of the Communications Decency Act of 1996. You understand that the technical processing and transmission of the Site, including your Content contained therein, may involve transmissions over various networks, and may require changes to your Content in order to conform and adapt to the technical requirements of connecting networks or devices. You acknowledge that Hypable is not obligated to pre-screen Content and does not review Content for purposes of compliance with the ToU, and that Hypable shall have the right (but not the obligation) in its sole discretion to refuse or move any Content and/or block access by the public to any Content that violates the ToU, the rules of any individual forum which have been posted in said forum, or is otherwise objectionable. Hypable does not claim ownership of or copyright in your Content; however, you do grant Hypable a perpetual, sub-licensable, world-wide, royalty free and non-exclusive license to use, compile, distribute, reproduce, modify, adapt, publicly perform and publicly display such Content on the Site for the purposes of providing and promoting Hypable (“License”). Hypable grants you a limited license to access and make personal use of this site. You may not copy, reproduce, incorporate, download (other than page caching), modify or otherwise use any material or any portion of any material located on the Site, including any Content, without the express written consent of Hypable or the author, user or artist who holds the copyright in the relevant Content, except when posting on or to Hypable or a site owned or controlled by Hypable. The Content is protected by copyright pursuant to U.S. and international copyright laws. You may not modify, publish, transmit, participate in the transfer or sale of, reproduce, create new works from, distribute, perform, display, or in any way exploit, any of the Content or Hypable in whole or in part. You may download or copy the Content and other downloadable items displayed on Hypable for personal use only, provided that you maintain all copyright and other notices contained therein. You shall abide by all additional copyright notices, information, or restrictions contained in any Content accessed through Hypable. The Content contains links to Internet sites, resources, pages, downloadable items and advertisers. Hypable is not not responsible for content on or availability of of these outside resources; direct any concerns regarding any external link to the site administrator or Webmaster of such site. Hypable respects the intellectual property of others, and we ask our users to do the same. We follow the requirements of the Digital Millenium Copyright Act in terms of the information we request when copyright infringement, such as the copying of a fic or of art, is claimed. If you believe that a work has been copied in a way that constitutes copyright infringement, or your intellectual property rights have been otherwise violated, please send as much of the the following information (“Notice”) as you have available to H. Tandy, 1111 Lincoln Road, Suite 400, Miami Beach, FL 33139. You recognize that some content on this site represents the opinions of the individual who has created such content, and is not endorsed by this site in any way. Hypable does not represent or endorse the accuracy or reliability of any advice, opinion, statement, or other information displayed, uploaded, or distributed through Hypable by any user, information provider or any other person or entity. You acknowledge that any reliance upon any such opinion, advice, statement, memorandum, or information shall be at your sole risk. HYPABLE AND ALL DOWNLOADABLE OR STREAMED CONTENT ARE DISTRIBUTED ON AN “AS IS” BASIS WITHOUT WARRANTIES OF ANY KIND, EITHER EXPRESS OR IMPLIED, INCLUDING, WITHOUT LIMITATION, WARRANTIES OF TITLE OR IMPLIED WARRANTIES OF MERCHANTABILITY OR FITNESS FOR A PARTICULAR PURPOSE. YOU HEREBY ACKNOWLEDGE THAT USE OF HYPABLE IS AT YOUR SOLE RISK. protect the property of Hypable or the rights, property, or personal safety of the Site’s users and the public.